LOCATION & DIRECTIONS: 3247 MATTHEWS MILL RD., GLASGOW, BARREN CO., KY. FROM GLASGOW (LOUIE NUNN PARKWAY & U.S. 31E) TAKE U.S. HWY. 31E SOUTH (SCOTTSVILLE RD.) 3.0 MILES; THEN LEFT ON MATTHEWS MILL RD. AND GO 3.3 MILES. PROPERTY ON THE RIGHT. AUCTION BANNERS POSTED. TRACT#1: 5.6 ACRES WITH 140’ FRONTAGE, MOSTLY ALL OPEN & LAYING NEARLY LEVEL TO VERY GENTLY ROLLING CROP-LAND. IMPROVED BY A ONE STORY 1,425 SQ. FT. +/- RANCH STYLE BRICK HOUSE WITH A FULL FINISHED BASEMENT. THE FLOOR PLAN OF THE MAIN FLOOR CONSISTS OF 3 BEDROOMS, 2 FULL BATHS W/ SHOWERS, KITCHEN, DINING ROOM & A LARGE FAMILY ROOM. THE WALK-OUT BASEMENT HAS A LARGE FULLY FURNISHED KITCHEN, FAMILY/DINING ROOM COMBINED, FULL BATH W SHOWER, DRESSING AREA, A LARGE BEDROOM, LARGE UTILITY ROOM, & A 14’ X 24’ STORM SHELTER. ALSO A COVERED FRONT PORCH, A REAR DECK OVER A CONCRETE PATIO, C/H/A (ALL ELEC. ), CITY WATER, MATURE SHADE, & LARGE GARDEN AREAS. ALSO IMPROVED BY A 24’ X 32’ METAL 2 CAR GARAGE W/ 16’ SHED AND A CALF/GOAT BARN. TRACT #2: 0.62 ACRE LEVEL LOT WITH 125’ FRONTAGE. IMPROVED BY A REAL CLEAN, REMODELED, WELL-KEPT 14’ X 70’ 2 BEDROOM 1 BATH MOBILE HOME WITH A COVERED BACK PORCH, FRONT DECK, C/H/A (ALL ELEC. ), MATURE SHADE, & GARDEN AREAS. ALSO IMPROVED BY A 24’ X 32’ WORKSHOP / BARN (WIRED) WITH ATTACHED CHICKEN COOP, & A 10’ X 12’ STORAGE BUILDING. TRACTOR & FARM EQUIPMENT: 1978 M.F. 255 DIESEL TRACTOR (S# 9A282334, FACT. HYD., 8 SPD., GOOD TIRES, RADIO) • FORD 3-14” PLOW • 6’ DISC • 6’ BUSHHOG • 4’ BUSHHOG • 1 ROW TOBACCO SETTER • 1 ROW CULTIVATOR • BOOM POLE • 5’ GRADER BLADE • SUB-SOILER • FORD 501 6’ MOWING MACHINE. TOOLS & MISC. : 1989 DODGE DAKOTA 2WD (NEEDS WORK) • (4) 5’ WORK BENCHES • 2 RIDING MOWERS • 350+/- CONCRETE BLOCKS • (3) HORIZONTAL SHAFT SMALL ENGINES • ELECTRIC FENCE CHARGER • (2) 55 GAL METAL DRUMS • FENCE STRETCHERS • SLEDGE HAMMERS • POST DRIVER • SEVERAL HAND TOOLS • LOTS OF TOOLS, WRENCHES ETC. • ALUM. TRUCK TOOL BOX • WHEEL HORSE RIDING MOWER FRAME • ELEC. GOLF CART • GOLF CART WHEELS & TIRES • BIG HILTI HAMMER DRILL • (2) HILTI SCREW GUNS • MISC. LUMBER • STORM DOOR • AND MORE!! PERSONAL PROPERTY & HOUSEHOLD: REFRIGERATOR • ANTIQUE SEWING MACHINE • ANTIQUE WOODEN PINEAPPLE DINING TABLE • COUCH & LOVE SEAT • WASHER & DRYER • OLD METAL TABLE • CHURCH PEW • MILK CAN • STEREO & CABINET • SEWING CABINET • OAK BOOK-CASE • WOOD CABINETS • LARGE BOX FAN • (3) TV’S • CHEST FREEZER • RECLINER • ENTERTAINMENT CENTER • OUTDOOR FURNITURE • ROCKER • (2) PORCH SWINGS • POTS &PANS • PRESSURE COOKER • TUPPER-WARE • DISHES • OUTDOOR SINK • LOTS OF NASCAR COLLECTIBLES • AND MORE. AUCTIONEER’S COMMENTS: THIS IS A GREAT LITTLE MINI-FARM THAT IS WELL LOCATED CLOSE TO GLASGOW & BARREN RIVER LAKE. 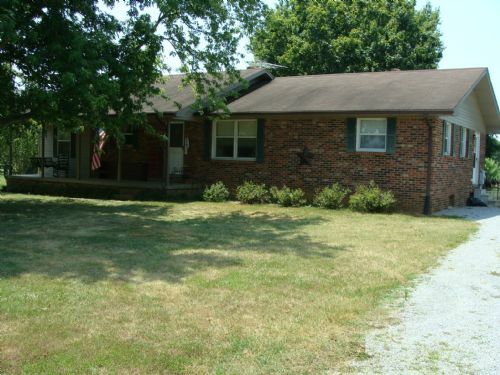 ALSO HAVING A GOOD 3 BEDROOM 2 BATH BRICK HOUSE WITH FULL LIVING QUARTERS IN THE BASEMENT & GOOD USEABLE OUT-BUILDINGS. THE MOBILE HOME & LARGE LOT IS ALSO WELL-KEPT & MOVE-IN READY. LOOK BOTH TRACTS & ALL THE PERSONAL PROPERTY OVER THEN MEET US ON SATURDAY AFTERNOON, AUGUST 4TH AT 1 P.M. TO BID & BUY THE AUCTION WAY. HOPE TO SEE YOU THERE!!!! COL. JOE, RYAN & JEREMY. TERMS: REAL ESTATE -15% DEPOSIT BLE) DAY OF AUCTION, BALANCE DUE WITH DEED ON OR BEFORE SEPTEMBER 4, 2012. POSSESSION OF HOUSE AND OUT-BUILDINGS ON OR BEFORE 30 DAYS FROM CLOSING.IMMEDIATE POSSESSION OF THE MOBILE HOME WITH DEED. 2012 PROPERTY TAXES TO BE PRO-RATED TO THE CLOSING DATE. A 7% BUYERS PREMIUM WILL BE ADDED TO THE FINAL BIDS TO ESTABLISH THE CONTRACT SALE PRICE. PERSOANAL PROPERTY - CASH OR GOOD CHECK WITH PROPER I.D. (CURRENT DRIVERS LICENSE REQUIRED AT REGISTRATION) ON AUCTION DAY. 6% KENTUCKY SALES TAX WILL APPLY ON PERSONAL PROPERTY NOT FARM TAX EXEMPT. Home was built prior to 1978. Any potential bidder will be permitted to conduct a lead based paint inspection 10 days prior to sale. Final bidder will be required to sign a cowaiver of any post sale inspection rights. All announcements made day of sale supersede prior advertising. Neither owners nor agents will be responsible in case of accident or injury. Bidders should satisfy themselves as to condition, quality, measurements, and description of real estate before bidding. All information and descriptions are believed to be correct; however no warranty or guarantee is expressed or implied. All property is sold “AS IS, WHERE IS”. Square footage information was obtained from the Property Valuation Administrator and Auctioneers make no Guarantee to the accuracy of the measurements.